As everyone knows, typing in a domain doesn’t always give you the site you intended to hit. And typos like this happen all the time. There are people who have realized this and are making money from it. There are two ways to make money from domain typos – either by using PPC and bidding on these typos (and then making money from the traffic you get on these usually cheap keywords), or by registering these domains and putting ads on the site for them. The people that do the latter are called “typosquatters”. And there’s potentially a lot of money in the ads for higher traffic domain typos. Keep in mind that if the owners of the real domain notice you doing this, they can ask you to take the site down. Whether or not typosquatting is ethical is a subjective question, but the fact is that some people make a ton of money from it, and so does Google. You can find out more about this and the figures involved in this article from Sideways News. I got an email from Microsoft adCenter promoting the new alliance between Yahoo and Microsoft. They’re calling it “Search Alliance“. The aim is to have their online paid advertising fully unified before the 2010 holiday season, although they did say that they’ll wait until 2011 if they “determine this will be more effective”. Microsoft bought out Yahoo, so now the primary tool behind both search engines will be Bing, and behind the pay per click (and other paid online advertisements) will be adCenter. The Search Alliance has stated that each company will “continue to have differentiated consumer search experiences”. Not sure exactly how they’ll pull that off with the same search engine for both, but they may just mean the search interface. The support will be broken apart, Yahoo supporting the bigger advertisers, and Microsoft will provide support to “self-service” advertisers. They are combining their platforms for the advertising audience, so ads put together under this new alliance will reach consumers using either search engine. The Search Alliance brags that advertisers of all sizes will now be able to have access to a combined audience of nearly 577 million worldwide searchers. At any rate, this is pretty big news – Yahoo and MS pulling together to battle the mighty Google. I expect this may be an epic battle. The stance Google’s taken on search engine optimization has always been a little hazy. However, they do acknowledge many elements of SEO as being important for a good web design (as implied by all the information given within the Google Webmaster Tools pages). But it appears they’re taking it a step further. Google has begun a small project by showing how to improve SEO for some select pages within countries in northern Europe. They will then put up a post about each page describing their findings and what they recommend to improve listing positions. This isn’t exactly offering SEO services for clients (like our own Tulsa SEO services), but it is showing that they acknowledge how important SEO is for improving results, and are even willing to help by giving some tips. Mark Jackson has a good article detailing more on this in ClickZ. https://www.tulsamarketingonline.com/wp-content/uploads/2018/07/TMO-Logo.png 0 0 TMO https://www.tulsamarketingonline.com/wp-content/uploads/2018/07/TMO-Logo.png TMO2010-02-17 13:46:542010-02-17 13:46:54Google Does SEO? It appears that Fortune 500 companies on the whole have not caught up to the internet marketing needed to rank well for their primary keywords. And many of them still don’t use pay per click marketing, even though the combination of the ones that do spend about 3 and a half million dollars daily for their keywords. The interesting thing here is with those millions being spent, you’d think they would put the money into SEO to push their primary keywords to the top of the listings, but it appears that they are not doing this. The companies are still improving on their listings, but it’s still a minority that are even breaking the top 50 in the SERP list for their primary keywords. MediaPost has an article with details on the exact figures involved in the Fortune 500 SEO results, as well as their PPC figures. So How Is Google Buzz? Google Buzz is the latest update from Google. Went live yesterday, looks to be Google’s effort to break into the social media market. I personally tried it out a bit, it ties directly to Gmail. It does do updates regularly, and appears to share the information with anyone who follows you. A lot of people have commented that it looks to be an imitation of Twitter. The nice thing is that you can connect to other sites, to reduce all the different social machines that need maintenance. 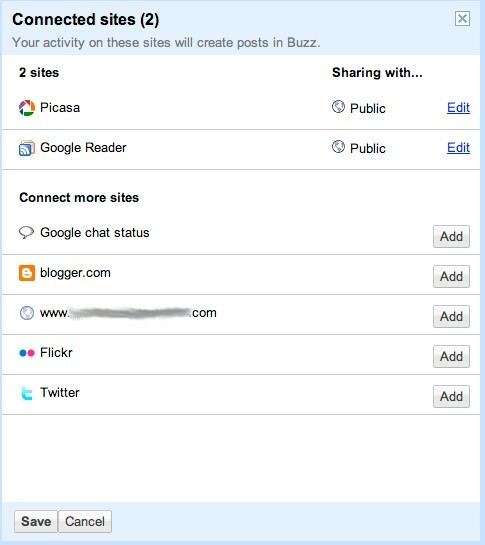 The default for me was to activate sharing with Picasa and Google Reader (I didn’t select either of these). The other options available are visible in the image above. The blurred domain is a site I set up on BlogSpot/Blogger through the same account. With Twitter, it will read your Tweets, but from what I can tell it only reads to Buzz, not vice versa. Looks like Google’s still ironing out the kinks on this, I’m sure plenty of people will be giving feedback for it. For now I find it nice since I don’t have the mass of content that is dealt out on Twitter, and so far it appears to still stay within actual social connections (and hasn’t spread into the marketing machine yet). So every “buzz” I’ve gotten so far has been from a friend, making an actual comment on life instead of a business telling me how good their merchandise is. I don’t know if it’s automatic for all Gmail users, but from the amount of people I’ve seen pop on with it, I’m guessing it is. It’s just another option underneath the Inbox, and it will show updates for some “buzz”es (but not all) within the Inbox. It appears it will post the updates for anything you have contributed to to your Inbox, with the little Buzz logo next to it. We’ll see if it’s something that gets used a lot or not, should be able to tell within a few weeks how well it’ll work. TMO https://www.tulsamarketingonline.com/wp-content/uploads/2018/07/TMO-Logo.png TMO2010-02-11 15:26:272010-02-11 15:26:27So How Is Google Buzz? There are a lot of standard black hat SEO methods that have been around for a while, but those that stray a little on the darker side of SEO keep busy. There are several new tactics that these people are using. As SEO becomes a more prominent form of marketing, black hat methods are also becoming more well-known. The latest term for these techniques is “poisoning”, which I find appropriate. These SEOs will put their poisoned links (which contain malware and installations of other nefarious elements) into various places where people will find them through either particular keywords or through social media. As a lot of people are not aware that these attacks happen, they can often give away account information, trusting that the sites they are visiting are reliable. These attacks come through Twitter and Facebook as well as through standard search engine results. For more info on this, check out this article by Last Click News. Doing SEO for a massive site can be complex. In the case of a large e-commerce site, you have a ton of pages with the different products. How do you organize the categories do good SEO for all these pages? This is a full project to do solid SEO, but some critical elements must be kept in mind. By looking at these concepts, this means that using the 80-20 rule is a great approach for doing good SEO for a huge site. Chances are 20% of your products produce 80% of your revenue. Focus on only these elements. Make these pages have solid content and fine-tune the on-page SEO here. By doing this, you don’t spend so much time on the other few thousand pages, and the results are worth it. In addition to this, try to be careful about categorization – it can hurt to have categories cross each other to make duplicate pages. For example, having a clothing store with a leather category and a shoe category could have the same page in both “leather->shoe” and “shoe->leather”. There are ways to avoid this, although my recommendation is to initially construct the categories in a way that this never becomes an issue. By taking care of this up front it will help with many potential duplicate content issues. Beyond these details, keeping great SEO for the site in general will always help. Following all these tips will increase your traffic and listing positions. For more details on SEOing e-commerce sites, check out this article by Eric Enge on Search Engine Land. The search engines evolve, as does most modern technology. The latest revision in search engine result pages is the “universal search”. This is the displaying of results for searches in not just web site links, but images, maps, videos, blogs, and more. The universal search allows a large breadth of information to be given that is relevant to any search done. For SEOs, this means adjusting approach on how to get relevant information out onto the web. When trying to publicize information about something you want people to discover, to make sure you can be found by different areas within this universal search you’ll want to make sure you go across multiple areas with your information publication. This can be done through audio, video, blogging, social media – or getting creative and doing it in unique ways. It all comes down to doing good marketing, just online. As the web evolves, so must our online marketing. For more good information on the universal search, check out this article by Ron Jones at Search Engine Watch.